U-M's entire ensemble for "Under The Lights at The Big House" vs. Notre Dame on Sept. 10 was unveiled tonight live from The Big House. 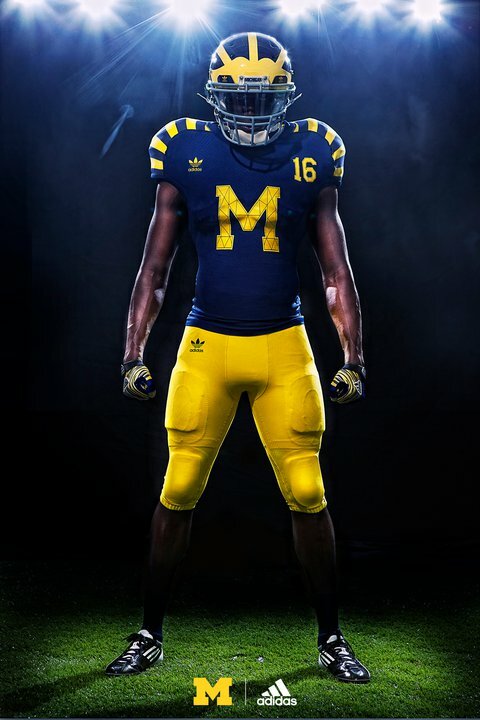 David Brandon, the Michigan Athletic Director, and Head Coach Brady Hoked unveiled the Jerseys that Michigan will wear against Notre Dame on September 10th for the first night game in the history of Michigan Stadium. The picture above shows Quarterback Denard Robinson and Defensive End Ryan Van Bergen showing off the jerseys for the very first time. ADIDAS has designed uniforms for both Notre Dame and Michigan to wear for the historic game and are calling them throw back inspired “Under The Lights” jerseys.